Phoenix Cityscape, completed 2013-2014. Land Owner: City of Phoenix. Just over two weeks remaining before the primary, and Arizona’s potential Republican chief executives have circumvented public discussions about the real estate market, and the return of cranes to Arizona’s skies. Yet the state’s historic reliance on construction was the first of several economy related topics at the Republican Forum for Arizona Governor at the Arizona Historical Society in Tempe, July 21. KJZZ Radio journalists Mark Brodie and Steve Goldstein interviewed the panel of governor hopefuls in front of an audience of about 200. There was noticeably less shouting than during KAET’s televised dialogue the night before. Revenue, immigration, school funding, and lawsuits against the Obama Administration garnered most specifics both nights, as well as most passion. But sprinkled between plans to eliminate state income tax and line the Arizona-Mexico border with sheriff’s deputies, a few of the GOP candidates generally supported cooperation between public and private sectors to encourage business. There have been dozens of cooperative efforts between developers and public entities statewide since the real estate market tanked in 2007, and each candidate saluted – in his or her own way – population and business growth as vital to Arizona economy. However, only former Mesa Mayor Scott Smith pointed to an actual example of publicly supported development. “Apple came to Mesa and was a five-year-overnight success story,” Smith said with a little dry wit. Mesa’s annexation and installation of infrastructure in the far east-valley lured the tech-god away from California and Texas (and potentially other east valley cities) to invest $2 Billion in a Mesa factory. “I looked at our city and said, ‘we can’t simply be a boat out here in the stream and go wherever the wind takes us,” Smith said. He didn’t elaborate on the mechanisms his city used to secure the deal with Apple, which included state tax deferrals and support for a foreign free trade zone. The project evolved into what is now DMB’s five-mile, master-planned destination community of Eastmark, located just off the 202 between Elliot and Pecos Roads. Smith’s reference to the Apple/Eastmark development was the most specific during the debate. Riggs, a Veteran, was a California Congressman for about seven years. He is a former police detective, real estate investor, and charter school developer. He didn’t directly answer Brodie’s question. Riggs said he aims to improve Arizona schools and proposes to allow businesses to write off same year investments. Riggs suggested the State Land Department could work to convince the Federal Government to release land in Arizona to generate more revenue for education. “Every level of government seems to complain about un-funded mandates, and then for some reason turns around and does the same thing to the levels below them,” he said after recapping his political career as a Prescott City Councilman and State Senate President. Bennett’s campaign website listed his support for freeing up federal land for state use, as well as a promise to immediately cease all State General Fund sweeps and restore funding to cities and towns for infrastructure. Christine Jones, former C.E.O. of Scottsdale based GoDaddy.com, made several specific suggestions for incentivizing small businesses throughout the night, such as eliminating redundant tax filings and local business permitting. However, her comments regarding development were limited to encouraging conservation of water and supporting Arizona’s water authorities. “Simple public service announcement: this is a desert, conserve the water,” she said. Marina Heights “State Farm” Project. Land Owner: Arizona State University. 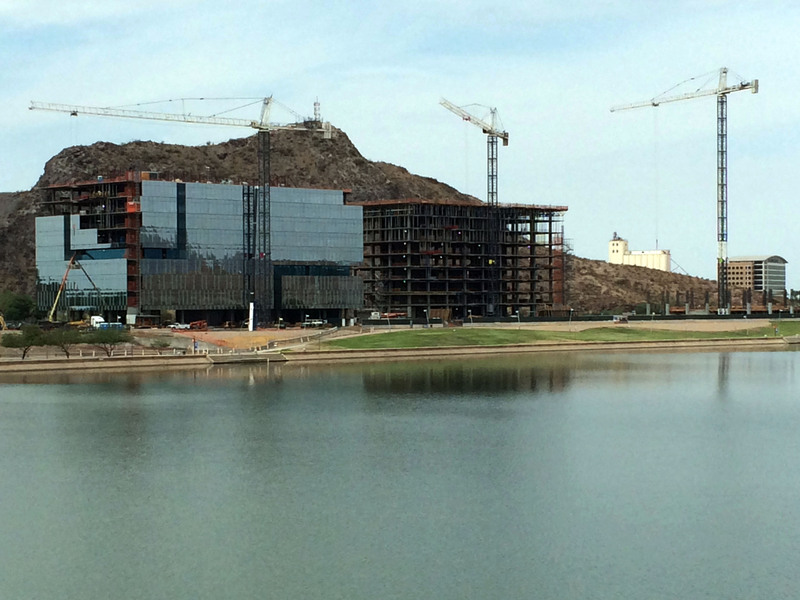 Meanwhile, less than two miles away from the debate, the self-touted largest commercial land development project in Arizona’s history grows closer to completion at downtown Tempe’s urban lakeside. State Farm Insurance contracted with Ryan Companies and Sunbelt Holdings to build a 20-acre mixed-use campus which will house 8,000 insurance related jobs. Competition for the regional administration hub volleyed between Texas, California, and several other states before landing permanently in Tempe, reportedly for its proximity to students training in business at Arizona State University. 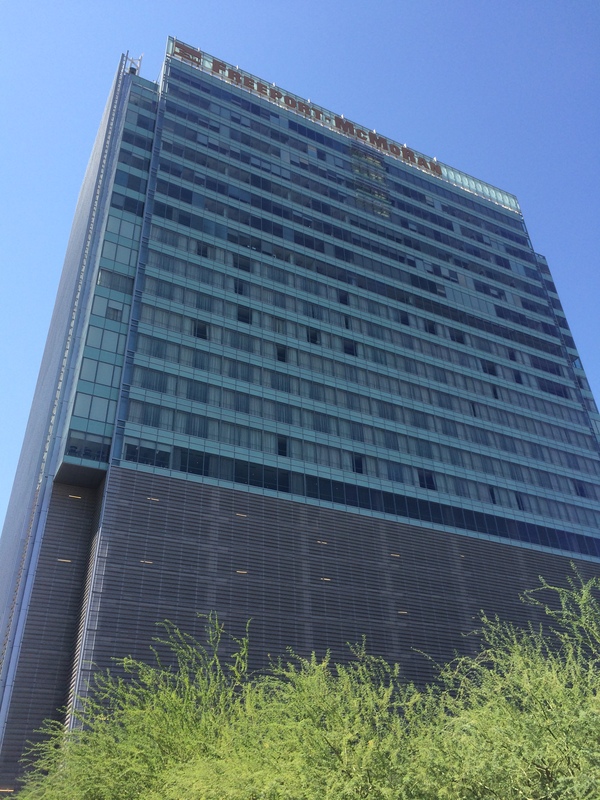 Marina Heights, so dubbed for its premier frontage along Tempe Town Lake, is also expected to include residences, shops, and restaurants for employees and the public. By leasing the land from ASU – a state agency – Ryan and Sunbelt were allowed to defer state tax payments until after the project’s completion, saving developers millions in financing as well. Despite the extra scrutiny (and bureaucracy) implied by government ownership, it is widely acknowledged the project didn’t stand a chance without local and state cooperation. Yet, neither the significance nor the implications of this joint venture between private developers and government were discussed at either Republican debate, nor the mechanism(s) that foster such developments. City ownership isn’t rare in Arizona cities. State law prohibits “gifting” tax abatements to private entities outright, and therefor requires municipalities or the state to lease the land, and freeze or exempt taxes to developers. Though politically touchy, The Government Property Lease Excise Tax (GPLET) allows developers to bring something besides powerpoint animations to financiers. Freeport McMoRan Inc. & Westin Hotel. Land Owner: City of Phoenix. 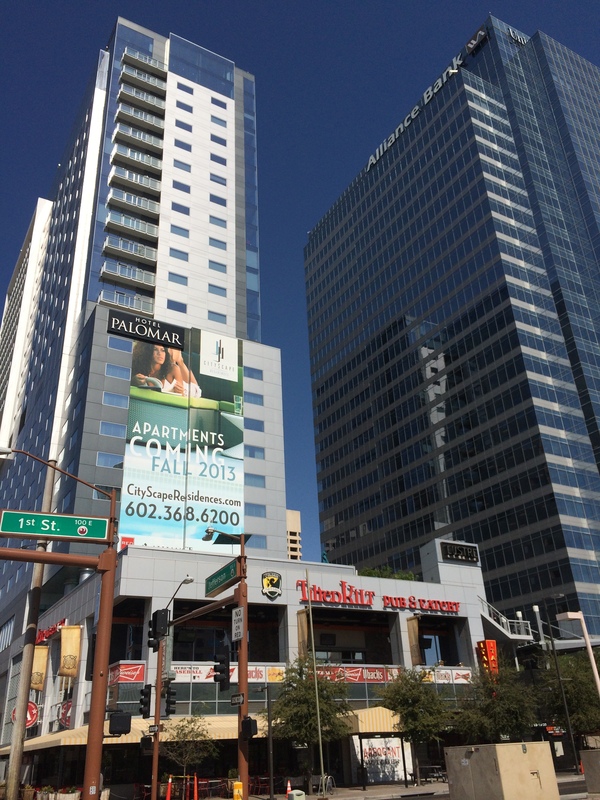 During five years of frozen capital, downtown Phoenix contributed the land for at least two commercial towers, a boutique hotel, several state-of-the-art educational facilities, renovated several deteriorating buildings, and oversaw the creation of Arizona’s first privately owned public park – Cityscape Pioneer Square. Tempe, Mesa, Gilbert, Chandler, and Tucson – to name only a few – have also used similar ownership/tax abatement strategies to resuscitate their downtowns into destinations for living and entertainment. These financing strategies weren’t inspired by creativity alone. They’ve come ostensibly backed by promises of job creation and tax revenue. Their success varies. Although subdivision permits aren’t flooding municipal coffers at anything close to pre-recession levels, Arizonans now flock to old banks, grocery stores, and gas stations for gourmet cuisine or their daily caffeine rush thanks to un-conventional developers, business owners, and city planners. Neither criticism nor praise for any of the creative thinking that occurred during worst economy since the Great Depression have been raised in public debates by the GOP Gubernatorial candidates. The candidates have simply been uninterested in discussing it, begging the question: does development– publicly incentivized or not – even register with Republican voters anymore? Disbarred former Maricopa County Attorney and Gubernatorial candidate Andrew Thomas did not participate July 21. He had no comments regarding growth or development the night before. The Primary Election will be held August 26. Midterms-in-hand, ASU Real Estate Development Master’s Candidates set out Sunday to join their alumni and prospective employers at the Urban Land Institute’s fall meeting in Chicago, Il. The sun set early as the Devils ascended into the eastern sky, their trek a welcome change from the design-studio-style class of almost thirty. The faction of future financiers, who attend class together Monday through Friday in the nine-month accelerated program, will tour some of Chicago’s most revered real estate. This year’s candidates range in age from mid-twenties to early sixties. They are artists, brokers, accountants, realtors, landlords and engineers. They are Arizona natives and foreign exchange students. Their goals for this week are as diverse as their resume´s. Some will face more challenges than others. Hwang moved with his wife and son to the U.S. from Seoul, South Korea a year ago. He worked for a real estate company in New York before he was accepted at ASU’s W.P. Carey School of Business. Hwang wants to learn from U.S. developers so he can eventually return and modernize undeveloped areas of North Korea and Russia. Innovation is certainly not unique in a city where dill pickles are served atop hot dogs and even McDonald’s features a revolving glass door. ULI hosts two annual summits in roving iconic American cities to showcase innovative and economic solutions to urban challenges. McCann has been building for over thirty years. Her craft has taken her all over the globe. She splits her time between Phoenix and San Francisco, where she lives with her husband who is also an architect. As part of their tuition, the MRED candidates will experience an insider’s tour of notable landmarks, past and present, including a private tour of Wrigley Field and the Prairie Crossing conservation community (urban farm) residential development. They will learn about Chicago’s retail staple, Merchandise Mart, from the perspective of its current owners. Their itinerary includes several traditional and modern skyscrapers too. But It wasn’t all rainbows and unicorns at the airport Sunday. The group were handed their Market Analysis mid-terms as they arrived at the airport. By mid-flight, they were socializing, watching movies, or catching up on rest. “I can’t think right now, I’m dysfunctional without food,” said Max Gomez, a twenty-four-year-old real estate broker from Tucson. U.S. Airlines charges for peanuts and pretzels, so only some ate anything on the plane. Garret, 35, was a budget planner with NASA before moving to Arizona for the program. “I’m looking forward to getting to know my classmates,” he said earnestly. Gomez and Garret were not the only ones whose stomachs grumbled during the flight. “It used to be you’d get a full meal and a glass of wine,” said Steve Grimes, a former Arizona appraiser in his sixties. Grimes wasn’t impressed with the flight itself, but enjoyed getting to know his neighbor, a Chicago developer who was not affiliated with W.P. Carey. “We swapped stories and business cards,” he said. Thousands of industry players are expected to attend this fall’s conference. The ASU Candidates will learn from, and rub elbows with market moguls throughout the week. Conlin co-teaches market strategy with fellow developer, and program director Mark Stapp. Conlin organized a majority of the trip. Conlin said there was a real possibility one of the candidates would meet their future employer during one of the dozens of seminars elaborating on post-crisis market analysis, strategy, and design. The crowd of cohorts were eager to get to their rooms at the chic James Hotel in the heart of downtown Chicago. Rain or shine, wind or warmth, the cohorts will rise early tomorrow for their first real test, the opportunity to network with today’s and tomorrow’s industry leaders. On location, Maricopa County Ariz. Superior Courthouse. The first man in line at the U.S. Supreme Court to hear arguments in Arizona’s historical immigration case is both a Mexican and American. The fourth jury empowered with deciding the fate of 29-year-old Daniel Renteria returned a guilty verdict for the death of only one of two men he confessed to killing in the middle of the day March 2010. The jury acquitted Renteria in the shooting death of James Marschinke, 49, whom he suspected of molesting his son. They convicted on 1 count of negligent homicide for killing Richard Rue jr, 41, who was with Marschinke the day they died. Pima County refused to drop charges after three previous juries could not decide to convict or let him go. Renteria called 911 and confessed to killing the unarmed men – in front of witnesses – five days after his son told him Marschinke, a neighborhood handyman despised by some neighbors, was coming into the four-year-old’s bedroom late at night and touching him. Renteria claimed the men threatened him days before the shooting if he went to police. Each judge has refused to let jurors hear the specifics of what police admitted in each trial was “credible evidence to support” the child’s accusations. Despite Arizona freedom of information laws, Tucson police have not released reports detailing supposed DNA evidence linking Marschinke to the child’s bedroom. The three trials called to head numerous quirks in Arizona law including lax gun registration requirements, the state’s broad justifiable-homicide statutes, the mental reasoning required to commit murder, the interrogation techniques of the police, and the prosecutors’ strategies. Renteria was held in custody until March of this year but released after his attorney, Natasha Wrae argued keeping him in custody in this situation infringed his Constitutional rights. Shortly before the beginning of this month’s fourth trial, Renteria was arrested on drug charges. The court did not allow the recent arrest to be discussed in the trial, which was prosecuted by Chief Criminal Deputy County Attorney Mark Diebolt instead of Casey McGinley who represented the state the first three times. Judge Richard S. Fields presided over the third and fourth trials as well as several plea hearings. The trials have been extremely emotional for the families of the defendant and at least one of the victims. The men were killed in the front yard of Richard Rue Sr., victim Rue’s father, the same year his wife died. Renteria’s family was in constant attendance for the first three trials. Though several said they wished Daniel had called police, they did not blame him for taking matters into his own hands. Renteria was estranged from his wife, Ashley Clarke, and living in their home at the time of the shooting. This reporter cannot determine from local media coverage if they have attended the fourth trial. Victim Rue’s family attended the first three trials as well but only the County Attorney’s victim liaisons represented Marschinke. All three men have previous convictions for petty crimes. Renteria was convicted in the original trial of “unlawfully burning” the car neighbors photographed him driving away from the crime scene the day of the shooting. He has yet to be sentenced for that crime. 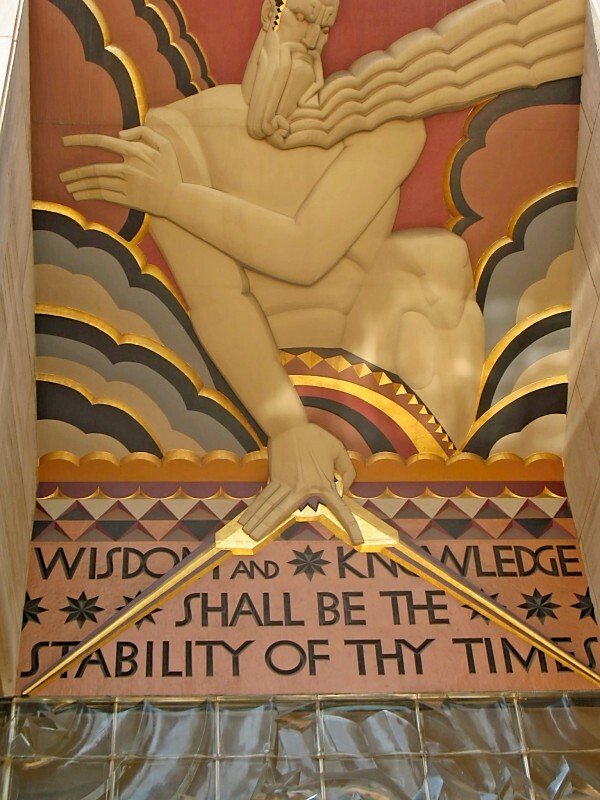 Click to Read Kim Smith’s (Arizona Daily Star) coverage of the fourth trial.